I thought a follow up post would be good since there were a couple of questions asked ( I like that!) and there are some things worth a mention that couldn’t be shoe-horned into the series. I encourage people to visit various sites like Forno Bravo to gather information on WFO construction. Really focus on how and why an oven works. Spend the time to study and understand the “boring” parts of the build…foundation, stand, thermal mass, heat soaking, etc, etc. The finishing has nothing to do with the function (usually) so a pretty oven that is inefficient is no fun to own or use. Here are a few key things I thought you might find useful or informative about WFO construction whether you are having one built or are tackling the job yourself. 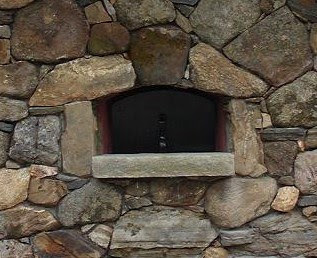 A WFO is also called a Masonry oven, Brick oven or Black oven…referring to the fact that the fire burned in the oven causes it to turn black, until the heat burns the soot off. When firing your oven, watching the black soot burn off from top to bottom is a great way to gauge when your oven has reached temperature and is ready for cooking. Until you get used to cooking in your WFO, a thermal temperature gauge is a handy tool for reading oven temp’s. One of the biggest mistakes made by new builders during construction is adding too much THERMAL MASS (TM). TM is things like the brick, mortar, cement, block, etc, etc. When you start a fire inside a WFO, the brick walls of the oven will be the first part that starts trying to build up heat. If there is more TM in contact with the brick dome or vault, the heat will just keep reaching back into it until all of the TM has reached the same temperature as the oven brick. To help visualize how heating TM works, think of two sponges that are layered one on top of another. If the bottom sponge is placed in water, it will continue to draw the water in until it is saturated. Now the top sponge will start to draw water from the bottom sponge because it is in direct contact with the saturated bottom sponge and both have the same properties and function….to soak up water. However, if the bottom sponge had a sheet of closed cell foam on top of it, the water would no longer travel out of the lower sponge because foam board does not absorb water. The foam board represents insulation…which is vital to evenly heating ( heat soaking )any oven. Unlike water, heat isn’t effected by gravity… so picture the sponge scenario without it. Heat just keeps reaching and reaching through TM..always trying to even out the temperature of all the material. Even though insulation is not totally heat proof, it does trap the most heat in the TM because of tiny air-spaces and non thermal properties. This allows the back of the material to reach a temperature that matches the inside of the oven, which finally produces a consistent oven temperature. It is mentioned by several building guides that you cannot have too much insulation but it’s possible to have too much TM. How much TM do you need? Most people that want a WFO only need a thin layer of TM…brick width and maybe a thin layer of cement…around 3″-5″ total thickness. The exception would be somebody that wanted to bake a serious amount of bread…like commercial quantities. Another drawback to a lot of TM….looong firing times and lots and lots of wood. It takes hours to get a thick TM wall to the point of regulating temperature ( heat soaked) whereas a thin walled, well insulated oven will take around an 1-2 hrs depending on the size. So to review..a 3″-5″ THERMAL MASS is sufficent for the needs of pizza making and moderate bread baking. Insulate, Insulate, Insulate. This goes for the floor too. Do not lay the floor bricks down on just cement or mortar..the slab below is TM. Some people use a thick sand bed but it is a very poor insulator. Use Vermiculite or Perlite mixed with portland cement and do a 5-8:1 Mix by hand gently…you don’t want to break up the flakes. Air spaces are your friend. Or some online stores sell ceramic boards which you can lay the floor bricks on. When insulating walls, you can clad them with a ceramic blanket ( 2-3) layers or mineral wool insulation ( rockite is what I used ) , then fill the structure ( like my oven ) with a 4″ minimum of loose vermiculite/perlite or mix verm/perl concrete and make a 4″ cladding on the dome. Ed J’s oven got a ceramic and loose fill. Here is that picture showing the blanket. Next, about curing fires. DO NOT get a cooking fire started until all the moisture is driven out of the bricks, mortar joints and cladding ( if you did it that way). The steam caused from the excessive heat can literally explode the bricks. I must admit ( as any normal guy would, I think ) blowing stuff up is good fun. But in this case, destroying your oven before you even use it would be a major bummer. Especially if you are looking into it when it blows. To avoid receiving a Darwin Award, build small low temperature fires and an all day burn is ideal. I did mine while working in the yard. Do this over the course of several days, gradually increasing the size of the fires each day. Forno Bravo has a complete burning schedule with temperature goals. Like I mentioned in the series, your brick oven WILL crack. Don’t worry, it is a normal part of the process. Small expansion cracks happen as the masonry heats up, then they close when the oven begins to cool down. A failure of the oven ( collapse ) would mean something was wrong with the way the oven was built….or you fired it too aggressively and the oven had too much moisture in it. Another step that should not be skipped is building a place to set a door. If you look at the picture below, you can see how the vent wall starts just outside the oven opening creating a lip to set the door against. The door is the damper for the oven. If your fire is raging and you want to slow it down, the door will do it. If you want to bake bread then a door is something you can’t do without…you must trap the heat..and your significant other won’t like you stuffing the clean towels in there to trap heat. You can make a simple door using cement board sandwiching ceramic material or insulating concrete. A metal or heavy wooden door will work as well. Make a simple one to start with, then you can get creative….This is the door that came with the oven kit for ED j ‘s oven. Now, about placing the floor brick. Once the insulation is in place, you need to set the brick. I simply used the brick dust from cutting the dome bricks ( scraped from the tray of my wet – saw ) mixed it with sand and set my brick floor. A thin layer of damp sand with bagged refractory clay works well too. 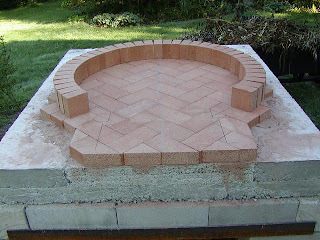 It is not necessary to set the bricks with mortar or grout the joints. They will fill in with fine ash soon enough and a dry set floor expands and contracts with the thermal cycling (heat up, cool down.) Remember, setting the bricks on an angle will allow the peel to slide in without abruptly stopping. But if you choose not to do this, take special care that your floor doesn’t have any lippage from brick to brick…unless you want to cook upside down pizza. It does make for a laugh ( at your expense ) to see the pie fly off the peel and unceremoniously flop top-down on the floor. Then your friends get to watch you frantically scrape the bricks clean while the toppings burn off and then fling the whole mess into the woods in disgust. Not that it ever happened to me… I’m just sayin. So at what height should your brick floor be? That would largely depend on who is using the oven. If you play in the NBA then you wouldn’t want to operate an oven built for an Oompa Loompa. The average range is between 40″- 45″ inches. Experiment with it before you build and find a comfortable working range. Finishes. I could start a whole separate blog on this part. There are infinite ways to finish an oven. 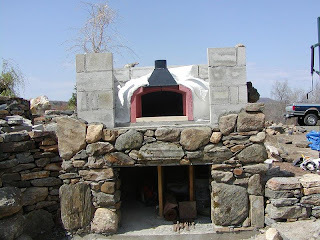 As long as you have a strong foundation for the oven slab, build and insulate the oven correctly, then go wild with it…or keep it super simple. There is no wrong way to do it. If you choose not to enclose the dome or vault with walls and a roof then you have to finish the outside so that it keeps rain water out of the brick. A way to do this would be to clad over the insulation with a portland based cladding mix and paint it….or stucco …or embed river rock/beach pebbles…or tumbled glass..or sea shells…or tile…my head hurts. See? Get creative! Just remember, you need to keep water from saturating the insulation and oven brick. I guess that’s about all..right now I can’t think of anything else but if I do it will be added to this post. If there is something specific anyone wants to know please leave a comment or shoot me an email. impressive on every level….sorry you had to leave that little outdoor paradise. Thanks Tim. I hope you can refer to these posts for your oven build someday soon!